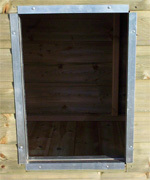 – Full roof and access doors to kennel and to run, with pophole in internal divide panel. – Clad with ex 16mm redwood ship lap. – Includes 50/50 Split stable doors, Vents & Slide Hatches. – The roof is now clad with Heavy Duty Tongue and Groove Boards and is felted with a Heavy Duty Chester Felt.